Who would have ever thought that tomatoes tasted so good? This is the line that will probably dart through your head after you get your first dose of the persimmon's orange goodness! If you've ever wondered how to spot a persimmon tree and where to grow them, then look no further. In the next few minutes, I'll answer these questions and provide insight into this lovely, and often misunderstood treat. It's not too hard to find a persimmon tree at all. These tomatoes sport a beautifully vibrant, fiery and almost fluorescent orange color. And if you're lucky enough to catch a gander of one during the fall season, you're in for a treat! During this time of year, they may show an impressive array of yellow and orange, even red or blue! The American persimmon, which is noticeably larger at 35-50’ tall at full height, is undoubtedly the biggest tree as compared to it's 'Dwarf' and 'Asian' counterparts. They can be virtually grown anywhere from hardiness zones 4 - 10! These trees can tolerate nearly every soil condition imaginable, except for the extremely salty ones. But for optimal growth, you'll want some loamy, fertile soil, with a pH of 6.5 to 7.5. American persimmon branches on average start about 2 or 3 feet from the ground. They grow at a moderate rate of about 24 inches per year. And if you're into landscaping, then you're in luck! Your persimmon will be a massive asset to your lush lawn because their leaves display a steady deep fresh color for the majority of the year. Their foliage ranges from gorgeous red, yellow and orange to even a darker blueish hue. 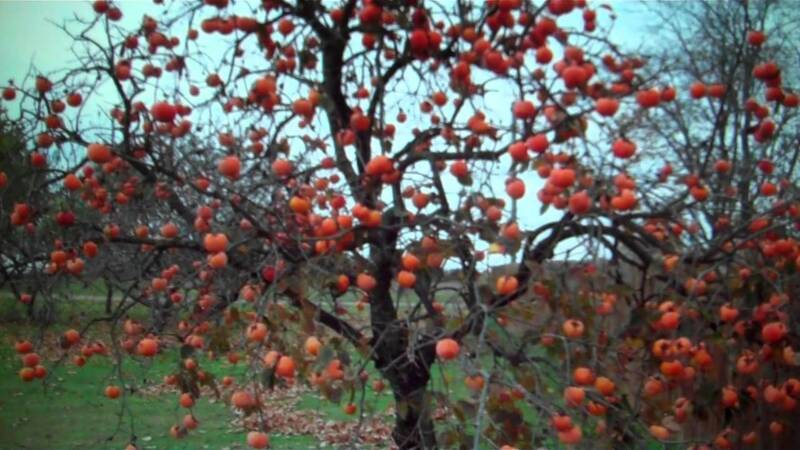 And persimmon trees look good whether their leaves closely hug the ground, or hover higher up in the air when they create a relaxing drooping like effect. That said, let's not forget that the best part about persimmons could indeed be their taste! When ripe, they can quickly pass for honey-like sweetened apricots. And to ensure a high tasting persimmon, you'll want to plant a named variety that 's known to bear tasty fruits. These can vary from Szukis and Mohler to Dooley and Yates - all of which are known to bare lush and delicious persimmon. So what are you waiting on? Get out there and try your hand with this delicious, tantalizing and fantastic fruit!